The first book that I ever read, apart from a comic, was a book titled 'The Secret Of The Silver Dolphin'. It was a book about two girls who embark on an adventure that soon turns into a mystery as they try to find the lost inheritance of their friend. I finished the book in a single sitting from dawn to dusk. Back then, while I was young, it would take time to finish any book. Because, like I said, this was the first proper book that I ever read. It has been decades since that day, but I remember the story with pristine clarity. The main protagonists even though were teenage girls, were brilliant! The story flowed with such an ease and the thrill was something else altogether for a first timer like me back then. Just when I thought that Carolyn Keene was the best author in the world and her books were the best thing to happen to me, I discovered another author called Agatha Christie. While I was just discovering reading, plays were an interesting concept. I remember begging my librarian at school to lend me the Shakespearean books that were written in the form of plays. While she denied at first, she later caved in. Since I took very good care of the book and returned them on time, she was very happy and very very kind. I ended up reading all of the Shakespearean plays back to back. Once done, I was still not over with the concept of plays. There is something very lively about reading a play. It's like being in a 3D book, where you can see the scene to its exact detail. Right from the heat of the fireplace, to the smoke coming out the chimney from the house on the hill. As I was walking around the school library looking for more books, my eyes fell on 'The Mousetrap'. It apparently was the longest running English play in history, and I almost immediately took the book home. Agatha Christie's 'The Mousetrap', made me fall in love with it from the first page. Rather from the first word of scene one. The description of every scene was so precise and neat that I could watch it unfold right in front of my eyes. Right from the oak chest in the center of the hall up right, to the stool on the the stairs on the left, I felt like I was seated in all of those. While the story revolved around a lot of characters, the murder was never forgotten for once. The mystery intensified with every page and it kept me guessing with every word. When it ended, I was in love. With the story second, but first with the author. I loved the book so much that I saved up money to buy a book with a set of her plays. Titled 'The Mousetrap And Selected Plays', this book was a prized possession. Apart from the one I'd already read there were three other mysteries and each one was better than the other. I lost that book during the course of time, but a few years ago I found the exact copy and bought it immediately. I must have re-read it about a hundred times now, but every time I read it I have felt the goosebumps and have fallen in love with the writing over and over again. While I haven't read any Miss Marple tales yet, I have loved and enjoyed the mysteries of Hercule Poirot. As and when I have got a chance to read an Agatha Christie book, I have never missed it. Once I remember walking around a book store and reading an entire book of hers while pretending to look over other books as I did not have enough money to buy it. Very recently, I came across some illustrated books of hers at my favorite bookstore. These books are a treasure and occupy the favorite corner of my book shelf. While the story and writing in itself is brilliant, watching it with a face to the characters is quite something else. There is not a single book of Agatha Christie that I have not enjoyed. Sure, I have loved some more than others but never not liked one. She has a huge role to play when it comes to inculcating reading in me and helping me improve my language and vocabulary. Till date, Agatha Christie books are the comfort read for me. I can re-read all of them any number of times and enjoy it with the same amount of thrill and enthusiasm. Agatha Christie, you will always be my hero! Agatha Christie has been my fav author too. Just yesterday, I added And Then There Were None in my TBR List! That book is a dream to read. Very well etched. I've read the play version of it and it is nothing short of brilliant! I have read only two books of Agatha Christie. Your post makes me think I should have read so many. Why didn't I pick them up! Now they are in my TBR list. Do read as much of them as you can. I assure you, you'll not be disappointed! Gosh, I didn't know there were illustrated versions of Agatha Christie's books, Soumya! What a treasure! Love your start to the AtoZ. Agatha Christie is one of our family favorites! Wonder what is in store for B? There are! And they are such a treat, trust me! Oh you should read them! They are simply amazing! I must confess that I read Sherlock Holmes before reading Hercule Poirot, and hence I love Holmes more than Poirot! But when you look at it from the story perspective, I feel that Agatha Christie is a master in spinning backstories and perfect endings. My favourite Agatha Christie book has to be the Murder On The Orient Express. The tying together of all the 12 characters was brilliant! Holmes is amazing too! But when it comes to spinning tales with perfect endings Agatha Christie rocks. Oh yeah, I've read that and loved it! Absolutely, completely and utterly a Christie fan and proud of it too. What a writer. The mousetrap is one of my favourite plays. I wish I had the time to read the way I used to, before marriage and a kid. I really do. One thing I completely miss about that life of mine. I wish you get the time to read more too. I agree she writes really well. Haven't read any of the plays. Read both Poirot and Miss Marple and preferred the Poirot ones for some reason. My favourite book though is 'And then there were none'. It was the best mystery ever and I never saw the ending coming. Everyone tells me that Poirot is better when compared to Miss Marple, so no surprise there. 'And then there were none' was brilliance personified. 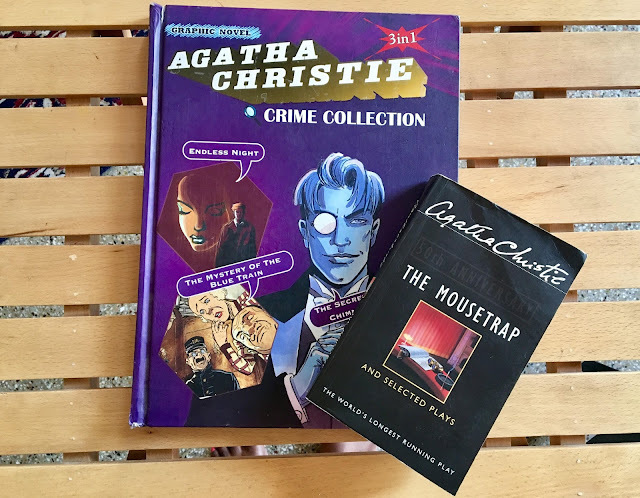 I enjoyed your post about your early memories of reading and about your passion for Agatha Christie books, Soumya. You make me want to read one as I've never read any of her books. I am a play lover, too and enjoy writing them since I often see characters in my head talking. Amazing you read all those Shakespeare plays for enjoyment. I read some in high school and wouldn't say I enjoyed them that much. Maybe a bit but overall I found them difficult to understand. When I went to the Stratford Theatre in Stratford, Ontario (not in England but they do have a Shakespeare theatre there) and saw some Shakespeare plays, then it came alive for me. Good for you with your reading passion! I look forward to reading your B post. Yeah, Shakespeare is a bit of tedious reading and it definitely is not easy to understand. Since I knew the back stories before reading them, it definitely helped me. Yes, that's one of my favorites too! Thanks Shalini! 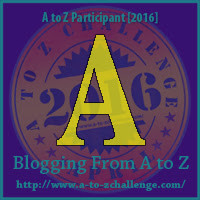 Happy A to Z to you too. A good story with characters and a strong plot strings me along like a luck to water. First - I love your theme and am going to follow it through. Agatha Christie is such a master story-teller. Who can forget hercule Poirot? I totally agree. Agatha Christie should ideally be essential reading for kids growing up. So much to offer. Have seen the illustrated versions but never bought one till now. Will check it out. Oh yeah it should be! They will learn so much. Do get some of the illustrated versions, they are brilliant! I have one other special gift from Dame Christie. David Suchet's sublime portrayal of Poirot in the iTV series. Thanks for this nostalgia pep. You're welcome and thanks for visiting. She's a hero all right. I never knew she had written plays though. I've even read the romances she wrote later in life though I never enjoyed them even half as much as her mysteries and thrillers. Man, what a writer! She wrote romances as well? Well, nothing can beat her mysteries. I can't remember a single book I've read of her, which is strange. Carolyn Keene... wasn't it Nancy Drew? Nancy Drew, yes! But Agatha Christie is many steps ahead. Do read her if you get a chance. I'll surely add Mousetrap to my list. My favorite from her is 'And Then There Were None'. It is one of the finest mystery thriller I have read so far. I was so hooked and was totally unable to decipher it. In addition, he whole setting and the concept is just phenomenal! And Then There Were None was an epic. What an ending! And the thrill was definitely unmatched. Do read 'The Mousetrap' when you get the time. Agatha Christie is a favourite of mine. Always springs up surprises. She writes with few words and is yet crystal clear.